I live next to a tall grove of pine trees. All year long I look forward to those first days of fall that bring the morning fog drifting through their shadowy boughs. It's mesmerizingly beautiful, to watch the tendrils curl and float along the air, highlighted against the dark of the branches. The air is calm, and the morning is almost silent... It's a still small moment of serenity before the rush and bustle of the day. This pendant is an interpretation of that fleeting moment of serenity. 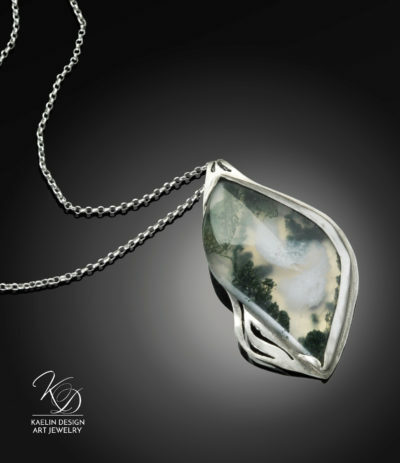 I set this gorgeous Moss Agate in a gleaming silver bezel, that leaves one side of the stone open, allowing light to pass through and brighten the stone. Not being content with that, I also pierced the backplate of the pendant echoing the drifting swirls of fog, allowing even more light to enter, and causing the light to shift within the stone. 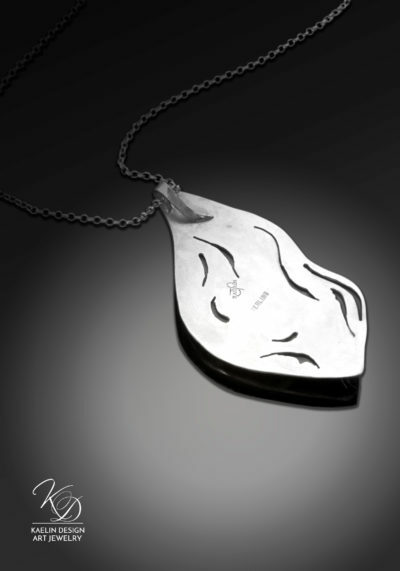 A unique art pendant, for the woman who embraces Serenity.